As Summer draws to a close you might be forgiven for thinking 'that's it, we've missed out on the beach season again', well, as our Pet Friendly Britain campaign continues, we're here to give you inspiration on places to visit in the company of your dog at any time of the year. Here are some of the most dog friendly beaches who will welcome you all year round in the South East of England. 1. Climping beach in Littlehampton, West Sussex - open all year round. 2. Old Hunstanton beach in Norfolk - open all year round. 3. Southwold Benes beach in Suffolk - open all year round. 4. Thorney Bay beach on Canvey Island in Essex - open all year round. 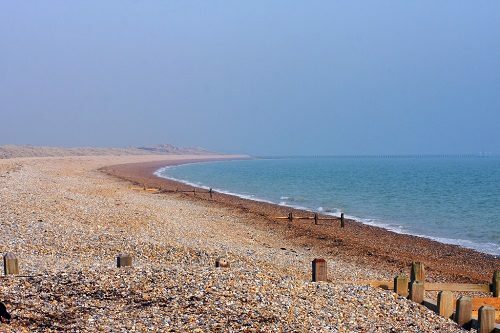 Located between Littlehampton and Bognor Regis, this beautiful four mile stretch of beach is an ideal spot to blow away the cobwebs taking an afternoon stroll along, or spending the day enjoying with your family. Suitable for shallow swimming, it's also very popular with those who enjoy kite and wind surfing. Dogs are welcome to roam the beach but must be on a lead near the Arun and alongside the road at Climping. Norfolk is home to many dog friendly beaches but quite a few have seasonal restrictions. The Old Hunstanton beach however welcomes dogs all year round. Typically a quiet beach, this lovely sandy beach with a shallow sea so you can join your dog for a paddle. The beach is also home to The Old Boat House cafe where they cater for both two legged and four legged guests. Located to the north of the main Southwold beach, photographed below, along Southwold's promenade is the dog friendly Southwold Benes beach. The majority of Suffolk's beaches have dog bans or restrictions throughout the Summer months. The main Southwold beach is one and dogs aren't allowed between 1st May-30th September. However the Southwold Benes beach is dog friendly and welcomes dogs all year round. Located on Canvay Island's popular coastline, Thorney Bay Beach is a sheltered sandy beach which welcomes dogs all year round. From the beach you can view Kent's coastline while you take in the sea air. A perfect place to watch ships going up and down the Thames before you head to the local fish and chip shop to try some of the local cuisine. It would be rude not to, wouldn't it? If you've found a pet friendly beach you'd like to share which isn't on our list, drop us a message and comment below to share your thoughts with fellow dog lovers!